under the small umbrella: That's my flop? Yet another "comedy" from Adam Sandler is about to hit the silver screen here in the UK. It does seem that it's going to be another good year for him, if only at the Razzies! 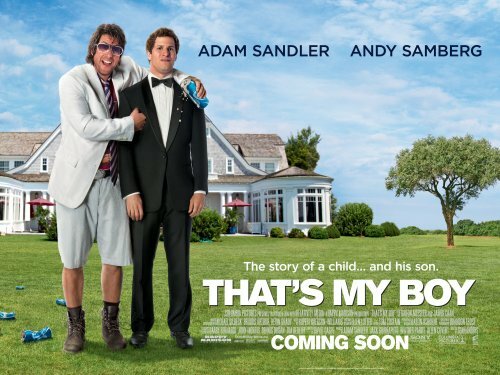 The outrageous comedy That’s My Boy begins when a teenage Donny Berger (Adam Sandler) meets the girl of his dreams. Only trouble is she’s his smoking hot teacher, Mary McGarricle. We’ve all had our schoolboy crushes, but Donny’s goes a little too far as Ms. McGarricle is only too happy to add a few lessons about birds and bees to her regular classes. Of course, it all comes crashing down, and Ms. McGarricle goes to jail, leaving Donny to raise their love child, Todd. Donny tried to be a good dad, but was completely unprepared to be a parent. Now, it’s 30 years later and Todd (Andy Samberg) is all grown up and a successful Wall Street executive – he split from Donny as soon as he got the chance and now hasn’t seen his father in years. But Donny is in trouble, owing tens of thousands to the IRS, and Donny figures that getting in touch with his son is the only way to get the money he needs to stay out of jail. Tracking down Todd on the eve of his wedding to Jamie (Leighton Meester), Donny crashes the party, turning a weekend of wedding festivities upside down. He’ll have a chance to finally bond with his son, but will Donny do what he knows he needs to do to be a good dad?